“It is certain that there is corruption. Everyone accepts this. From the uneducated to the educated to the elites — everyone sees and knows what is going on. And no person has the power to cover this up,” Gülen told the BBC at his residence at Pennsylvania, where he has been living in self-imposed exile since 1999. Responding to allegations leveled against the Hizmet movement, Gülen said the government was not happy with the investigations and accused the Hizmet movement of being behind them. “The investigating prosecutors and police did not know that these things [corruption, etc.] were no longer considered crimes and they pursued the matter. This made the government unhappy and as a result they are talking about a state within the state. This is what it is,” he said. Gülen denied that all of the officials the government has reassigned or demoted in a massive reshuffle of the state bureaucracy centered on the police and judiciary are connected to the movement. “It is wrong to think that all the people the government purged and reassigned are those sympathetic to the Hizmet movement. Among those people I believe there are social democrats, nationalists and ultranationalists,” he said. “The government moved against the police, the prosecutors and the judges in whatever part or city of the country where they were investigating such incidents,” Gülen added. He argued that commentary portraying the Hizmet movement as “very big and widespread” is meant support claims that the movement comprises an alternative or parallel state. The scholar added that those who are behind the defamation campaign against the Hizmet movement are trying to scare people by exaggerating the movement’s size and influence. “I suspect that they are using these corruption investigations as an opportunity to show their discomfort with the movement. Perhaps those that are doing this today will regret their actions in the future,” Gülen said. Attacks on the movement are also harming Turkey, he continued, adding that the government’s recent anti-democratic steps that violate the rule of law will damage Turkey’s image in the United States and the European Union. “Almost everyone is saying this today,” he said. 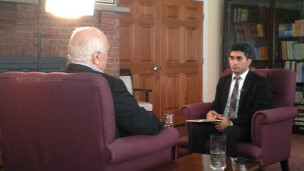 Gülen reiterated that he has never been completely aligned with any particular political party. “Instead, we always considered it a part of our human responsibility to support the good works of these parties,” he noted, stressing that his message on the eve of Turkey’s elections — local, presidential and national — would be to encourage voters to support those who defend the rule of law. What is your view about the current corruption investigations in Turkey and turmoil surrounding them? I don’t know where to begin. It is certain that there is corruption. Everyone accepts this. From the uneducated to the educated to the elites — everyone sees and knows what is going on. And no one has the power to cover this up. But I suspect that some people are uncomfortable with the Hizmet movement. These investigations are being used as a pretext against the movement. The judges and prosecutors overseeing these investigations are being scattered around here and there. To show the movement as being very big and widespread, to justify [Prime Minister Erdoğan’s] argument that the movement comprises an alternative or parallel state, they claim that those officials who they reassigned and scattered around the country all belong to one movement. They are trying to scare people by showing the movement as being very big. They are trying to break off [AK Party] supporters who are sympathetic to the movement. I suspect that they are using these corruption investigations as an opportunity to show their discomfort with the movement. Furthermore, there are partisan supporters within the media and media outlets who are misrepresenting certain things. However, I believe that the things being done against the movement today are also causing Turkey to lose. These things will affect the view of the United States and the European Union about Turkey in a negative way because these actions by the government are anti-democratic. These actions are against the rule of law. Almost everyone is saying this today. It was leaked to press that the National Intelligence Organization (MİT) informed the prime minister about the [corruption] issues eight to ten months ago. People in the judiciary and the police carried out investigations and launched this case, as their duties normally require. Up until now, bribery, embezzlement, theft and cronyism were regarded as criminal activities. That is why the judiciary and the police went after these people. The investigating prosecutors and police did not know that these things [corruption, etc.] were no longer considered crimes and they pursued this matter. This made the government unhappy and as a result they are talking about a state within a state. They are not talking about wrongdoing such as bribery, about the rigging of state tenders. These things are being presented as normal and acceptable. This is what it is. It is not possible for these judges and prosecutors to receive orders from me. The government moved against the police, the prosecutors and the judges in whatever part or city of the country where they were investigating such incidents. They threw these people out. They had done this before. Those attempting to investigate the government are officials who the government appointed. And if the newly appointed people try to do something, I imagine they would be replaced by others by the government. What is happening is this type of mayhem. This situation has nothing to do with me. As I have said previously, I do not even know 0.1 percent of those running these investigations. I can say this wholeheartedly. Isn’t it also true that one upon a time you saw a common cause with the AK Party and Recep Tayyip Erdoğan? We have never been completely aligned with one particular party, whatever party it might be. Instead, we always considered it a part of our human responsibility to support the good works of these parties. As a result of this thinking, I said something that I had never said before. I said that people should vote “yes” during the 2010 Turkish referendum in support of a democratic step. If they have reasonable and positive attitudes with respect to the rule of law, democratic principles, serving people’s needs and building good relationships with neighbouring countries, we might seem to stand close to one another on these values and principles. Some people both from the Hizmet movement side and from the other side have said that tensions will not reduce and peace will not prevail until the presidential elections. How do you see the near future for Turkey and the Hizmet movement? The present atmosphere of revolt, enmity and hatred cannot be extinguished quickly. Many people’s honors have been downtrodden and the pride of many have been hurt. This cannot be restored that quickly. It may not be possible to bring everything back to a state of harmony. But I have never lost my hope. I still believe that it will happen. The letter sent to the president of Turkey through a mutual friend sent by him was a step in that direction. I have known Mr. Fehmi Koru [the mutual friend and a columnist] since his days as a student. Both he and President [Abdullah] Gül welcomed the letter. But the prime minister was unhappy with the letter, perhaps because it was addressed to the president and not to him, or because it called on people in the media to stop discrediting and swearing at each other. He expressed his displeasure publicly in a press meeting. I think there is a close circle around him like the historic elites of the imperial court who are misrepresenting matters to the prime minister. Neither my heart nor my conscience or my tongue can tolerate saying that he is unstable or that he is in a state of paranoia. But I think this close circle is pushing him towards such disturbing things. You are here in the United States now, but if you were back in Turkey … We have got two big elections coming up this year. We have the municipal and presidential elections. Would you vote for the AK Party, would you vote for Mr. Erdoğan to become the next president of Turkey? If I say something, it will be this: Vote for whoever stands for the rule of law and rights, is upright and sound, whoever is respectful of democracy, whoever gets along with those around him — if I am to say something, it will be this. Other than that, I would consider it an insult to people’s foresight and intelligence to tell them which party to vote for. Everyone sees all that is going on. I would not push people to choose one party over another. The AK Party government holds that they are in the process of purging those members of the police and the judiciary who are affiliated with the Hizmet movement. Are you concerned about this development? Any form of wrongdoing discomforts us. But it is wrong to think that all the people the government purged and reassigned are sympathetic to the Hizmet movement. I believe there are social democrats, nationalists and ultranationalists among those people. And it is not in our hands to say to people, “Beware, never ever feel sympathy toward us; do not appear to be participants of our movement.” We do not have a responsibility to make such a declaration. They can feel sympathetic toward us. As I have expressed before, I do not even know 0.1 percent of the people the government keeps reassigning and herding around here and there, from one place to another. I believe that those responsible for these actions will question what they have done when they come face to face with their conscience. On the Kurdish issue we supported a peace process before the government. All I can do is to encourage. I had sent a document with recommendations and proposals to the prime minister stating that that the [southeastern] region needs to embraced. That its needs in education, healthcare, religious affairs and security are met. I said that if you do not embrace these people, those who have been persecuted in the past will carry on and grow their grievances into the future. But these views were not taken up. Perhaps it has been about 10 years since we put our views and recommendations forward. We did this before they had done so. When the government did not act on these, people from the movement who I do not know opened schools in that region. They opened study centers. They tried to prevent fighting in the mountains through education. But they have tried to show me as being against the peace process. No. Absolutely no. Maybe our method was different to that of the government. We were of the view that the issue needed to be solved through education, that the problem needed to be solved through coming together and unity and at the same time, tried to address the poverty in the region through investment. And, by and large, these things have been done. In this respect, the allegation of the movement being against the peace process is slander, it is an unfair portrayal, it is a form of aggression and attack. Specifically on the Kurds again, a lot of people have said that you have had concerns about the settlement process with the [Kurdistan Workers’ Party] PKK and Abdullah Öcalan. Is that correct? Öcalan was unhappy with what we were doing for the Kurdish people. For example, the reading halls, the community centers; the things that were being done to prevent young people from joining the militants in the mountains. The PKK, the PJAK (Party for a Free Life in Kurdistan) in Iran and the PYD (Democratic Union Party) in Syria expressed their discomfort with our activities. They don’t want the terrorism to stop. They are unhappy with activities that seek to build bridges between the Turks and Kurds. Their policy is to maintain enmity between Kurdish and Turkish people. We have not had an adverse attitude toward them, but the PKK’s attitude is hostile toward us. In order to have good relations, to give the appearance of being nice to Kurds and to get their support in the elections, the current administration blamed everything on what they call the Hizmet community or movement. I want to ask another question, concerning the Kurdish issue, in terms of clarifying your ideas. Are you particularly against the idea of negotiations with the organization? Negotiations can be made with the PKK; we see no harm in that. However, they should been done in a manner that maintains the dignity and reputation of the state. If you act contrary to this, then history will record that as an act of the “parallel state.” The Republic of Turkey is a nation of Kurds, Turks, Laz, Circassians and Abkhazians; that is the people of Anatolia. Actually, we use that phrase often. In terms of emphasizing unity and togetherness, it is an important term. We were never against the Oslo negotiations, the discussions with Öcalan, the discussions with the PKK in Kandil. As I said in a recent interview: “Peace is essential, agreeing with one another is essential.” I suspect that 80 percent of this community want peace; that only those in the mountains do not want this. Only those under the influence of Iran or Syria do not want peace. These people are unhappy with peace; Cemil Bayik, Fehman Huseyin are unhappy with this. The people in PJAK (Party for a Free Life in Kurdistan) in Iran are unhappy with this. Why? Because they would argue that we are trying to assimilate the Kurds. In fact, I have both encouraged and told those people who have come to see me that there should be a Kurdish TV channel that teaches the Kurdish language, that there should be a Kurdish TV channel. At the same time, I have encouraged and said that Kurdish should be taught as an elective lesson in state schools and universities. In other words, I have encouraged these reasonable and necessary steps to be taken; I have said these things. You would end up with a big book if all the things that we have said on the subject were collected. But for some reason, to denigrate the Hizmet as bad, we have been shown as being against the peace process in certain media. You have always touched on the importance of interfaith dialogue on an international level, but there are certain tensions between Sunni and Alevite communities. As far as I remember, you indicated the necessity of joint mosque-cemevi projects. However, some Alevi groups gave their objections to the projects as well as disclosed their assimilation concerns. How would you respond to those concerns? Not all Alevis think the same; there are people who welcome the project such as well-known figures in Turkey like Prof Izzettin Dogan. The mosque-cemevi side-by-side project, as you indicated, dates back to 1995. We sincerely believed this project would be a bridge-builder between Turkey’s Sunni and Alevi communities. I think those who claim that this is an assimilationist project will regret saying so in the future. The mosque-cemevi project is certainly not about assimilating one group into another. If those who want to go to the mosque go to the mosque and do their prayers and those who wish to go to the cemevi go to the cemevi and do their sema and when they come out and sit together, drink tea together in a common space, sit together in the garden they will see that neither side is trying to consume the other. The idea that one side will annihilate the other has become embedded in the subconscious. It seems that for some this is a dream they want to come true, and only time will show us how this will develop. These places should benefit from the means provided to the Religious Affairs Directorate of Turkey. The Alevi Dedes should come and head these cemevis, and they should be paid a salary by the state. Let them live, teach and exemplify their own values. And let the Sunnis exemplify and represent their own values. This idea was about bringing about brotherhood between these two communities. No one involved in this project had any aim of assimilating anyone. Anatolian Alevis are different from Shiites. Alevis in Turkey have deep respect for our traditions dating back 1,000 to 2,000 years. They have sema, their own form of prayer or ritual, similar to the sema of Mevlana Jelaleddin Rumi. They do that. This should not separate us; these should be approached with respect. Based on what I said earlier, these people should not fear that they do not have a place within your heart for them. As for assumptions and paranoia, only time will tell and prove if they are true or not; time will prove that no one involved in this is looking to assimilate anyone. En ostanut noita Minimarketteja, mutta toisesta kaupasta lÃ¶ytyi jotain yhtÃ¤ ihanaa alessa (aiheesta tulossa pian postaus). Niin muuten nÃ¤yttÃ¤Ã¤ nÃ¤yttÃ¤Ã¤! On se niin sÃ¶pis… Harmitti, kun ei tullut otettua siellÃ¤ sushi-raflassa kuvia meidÃ¤n mustasta jengistÃ¤. As a matter of fact I have come across this entry by accident, but I am truly glad for that reason. Thanks to this material I have become attracted to issues, which I couldn’t have been noticing before.